Wilfredo and Glorimar Corps are long-time RBCers originally from the town of Aibonito, in the center of Puerto Rico. As most of us are aware, Puerto Rico as recently been devastated by two hurricanes. When they visited Aibonito a week ago, Wilfredo and Glorimar were dismayed to discover both the extent of the damage and that much of the aid sent to Puerto Rico has not reached inland, where their town in located. Many families there are hurting, as well as a large senior assisted-living facility that is unable to provide three meals a day to its residents. Twenty-two years ago, Wilfredo and Glorimar planted Primera Iglesia Bautista de Aibonito (First Baptist Church of Aibonito) in their garage. The church continued to grow even after the Corps left Puerto Rico for the mainland United States. Today, we have the opportunity to partner with this church to bring much-needed aid and supplies to the people there. The church has procured a waiver from the Puerto Rican government that will allow us to send a large amount of supplies and aid without import taxes. Wilfredo and Glorimar will be on-hand in Puerto Rico to receive our shipment of donated items, transport them to Aibonito and deliver them personally to people in need. On Sunday, October 22, from 8:30 a.m. to 1:00 p.m., we will have a truck parked in front of the main building on the traffic circle where you can drop off aid and supply items you see on the list below. The goal of this project is to provide some basic necessities to sustain the people of Aibonito for the next 30-90 days, the estimated time frame until power and basic utilities will be restored to the town. Feel free to donate any of the items above in bulk as we are planning on a large container in which to ship them. Finally, if you order anything from Amazon, please consider using smile.amazon.com, where you’ll find the exact same shopping experience as Amazon.com, with the added bonus that Amazon will donate 0.5% of the purchase price to RBC’s Benevolent Fund. You use the same account on Amazon.com and AmazonSmile, so your shopping cart, Wish List, wedding or baby registry, and other account settings are the same. On your first visit to AmazonSmile, simply select Reston Bible Church as your charitable organization. The website will remember your selection, and then every eligible purchase you make from then on will result in a donation. 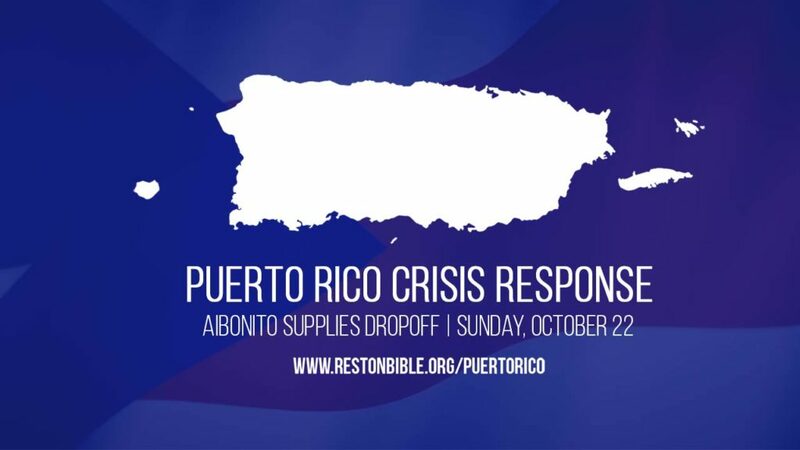 We are looking forward to seeing how God will use the people of RBC to share Christ’s love with recent victims of natural disasters, first in Texas and now in Puerto Rico. Thank you for your willingness to help so many hurting people. God has called us to love and “be neighbors” to those He has placed around us! This year we are adding an additional aspect to the First Fruits Project: The Heart of First Fruits. We are asking you, the body of Christ at RBC, to consider the needs of the people around you and how you could tangibly bless them over the weeks of First Fruits and Thanksgiving. Prayerfully consider whom God might put on your heart, and then think of a practical way to encourage them. Some examples you might think about: a single mom, an elderly couple, someone dealing with an illness, someone who lost a job, a young couple with young children, someone with no family near by, or even someone with no perceived need at all. Your encouragement could be anonymous, but it doesn’t have to be. It could be fresh baked cookies. It could be an invitation to come to dinner at your home. 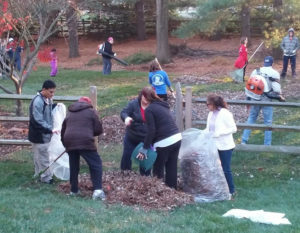 It could be raking the leaves in their yard or fixing a leaking faucet. The options are many. Just ask the Lord how you can bless someone around you — the way you would want to be blessed if you were in their shoes. It is the heart of the Lord to bless us and for us to pass on this blessing to others. Enjoy this opportunity to love others as unto Jesus. We would ask one additional thing — that you share how God leads you to live out the “Heart of First Fruits” and what happens. We would love for you to share your story using the button below. We will keep your name and those you bless confidential. Our goal is to allow the body of Christ at RBC to hear how God has led us individually to love our neighbors. We will provide a follow-up after the event so we can hear how God’s hands and feet responded! We hope you will choose to join us on this mission – and for it to become a regular part of all our lives. Please pray for the hope of Christ to reach theses devastated regions. For those of you who have been here 10 years or longer, you probably remember our extensive involvement with disaster relief following Hurricane Katrina (sending a dozen work teams and a truckload of food and other supplies). At the moment, we ask that you pray, pray, pray for the victims and for an effective response that demonstrates God’s grace and love. Disasters like this often provide many opportunities for people to talk about Jesus Christ because of their joyful endurance, hopeful spirit, and works of love. Here’s where we currently stand. As we did with Katrina, we are waiting until things settle down somewhat to determine our course of action. We certainly do not want to be in the way of early response teams, FEMA, etc. as they continue to rescue people and sort out needs. We also must find a church or churches in the area to partner with. We have learned from experience that this is the most effective way to extend our help from so far away. When it is safe for us to enter affected areas, we may once again send work crews to help clean up and repair. However, we need to wait until the danger has passed so as not to complicate the ongoing rescue operations. For example, many churches there are currently overwhelmed by acting as temporary shelters housing evacuees. They cannot accommodate work teams right now. Some hotels are reporting 10 or more people per room with little more than the clothes on their backs. So, as hard as it is, we must wait patiently for the right moment to be the most effective – remember, we sent our first team to Katrina (I was part of that team) six weeks after the storm. Samaritan’s Purse is currently on the scene assessing the damage. We have teamed with this organization in the past and have been richly blessed by it. The American Red Cross is taking donations to help victims and asking people to donate much-needed blood at local drives. World Vision is assembling Family Food Kits. SPCA is helping families connect with lost pets. Finally, if you have family members who have been severely affected by Harvey in the greater Houston area, or by Irma in Florida, please let us know. If and when we do send teams, we would love to start by rebuilding homes of your loved ones. Please address your immediate questions to me at dalepeak@restonbible.org and continue to pray for Houston and Florida! This post has been updated in response to the impact of Hurricane Irma in Florida. Many weeks ago, we made an announcement that Dr. John Brewer and been recommended for termination as principal of Dominion High School. By now, many of you know that the Loudoun County School Board concluded their discussions last Monday and voted 6-3 to reinstate John as principal beginning April 17. On behalf of John, his wife Rachel and their daughters, they wanted us to pass on their deepest gratitude for the outpouring of support and prayers you showed them during the time of uncertainty. The LORD Jesus answered our prayers by having the School Board reinstate John as principal, and so we rejoice with the entire Dominion community that he will be back serving there soon. While we care about John returning to his position as principal, we care even more for the reputation of his character when it is maligned. The incomplete facts found in newspapers, web sites and uttered elsewhere is partially due to not having access to all the facts. So much of what has been written and said could easily leave people suspicious of John’s basic character and integrity on a number of fronts. A few things to bring to your attention: Several weeks ago, an independent hearing officer chosen by the Loudoun County School System heard two days of testimony from the Superintendent, school attorney, John and his attorney. The testimony centered on eight specific charges on why John should be terminated as principal. The hearing officer concluded that none of the specific eight charges – considered either individually or collectively – warranted termination. In summary, the hearing officer ruled 8-0 in favor of John as it pertains to termination. Nevertheless, the hearing officer did recommend some form of probation. In order to place John on any form of probation, legal technicalities required that his current contract first be terminated so a new contract with terms of probation could be offered. That is the reason the board first voted 9-0 to terminate John. The first vote was not to agree with the Superintendent’s recommendation to terminate, but to satisfy legal requirements regarding his current contract. If this technical procedure had not been required, then the School Board would have voted once with six members voting to reinstate John and three voting to terminate him. John acknowledges that there are some process and procedural matters that he should be more cognizant and alert to. Keep in mind that in his many years in the Loudoun County School System, there is no pattern of problems, even in those areas that he will be more attentive to. Furthermore, he has never ignored or treated lightly any allegations of misconduct by any teacher or student, and he has never coerced or manipulated any student to ever attend Reston Bible Church. It is also noteworthy that the teacher who was the catalyst for all this applied to multiple school systems around the country including the one in Florida. Each of them, except Florida, contacted either LCPS or John to further inquire why the band teacher abruptly resigned. After hearing a fuller explanation, all of them declined to extend an offer. Again, only the school system in Florida did not perform the due diligence all the other school systems did. This does not constitute our full opinion on this saga or address other important issues, but we hope as you think of John and Rachel in the future please continue to pray for them, the Dominion High School community and everyone involved in LCPS administration according to each one’s need. John and Rachel have been an excellent example of the admonishment in 1 Peter 2:12-23, which we hope you’ll take some time to read. I have a very important announcement regarding the recent recommended termination of Dr. John Brewer from his position as principal of Dominion High School in Sterling. In addition to his fifteen-year tenure as principal, John and his family have also faithfully attended and served here at Reston Bible Church for many years. John has a long-term proven record of outstanding character as he has consistently lived in the grace of God as a husband, father, teacher and principal. Dr. Brewer was Commended by the Loudoun County Board of Supervisors and named by the Loudoun Times Mirror in 2008 as “Citizen of the Year” because of exemplifying kindness, competency, professionalism, and reliability and how those qualities positively impacted students and teachers. John was also named the 2010 Loudoun County Principal of the Year. Dr. Brewer visits the home of every incoming freshman to meet them and their family, demonstrating initiative and humility. John writes a personal letter to every graduating student evidencing his sincerity and care. Dr. 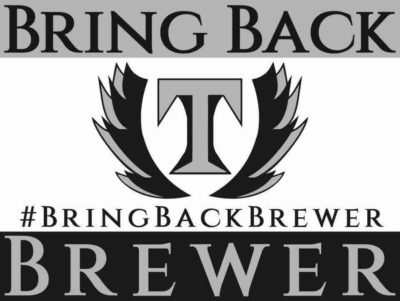 Brewer was notified of the recommendation for termination a few days before Christmas. After much prayer and counsel with our youth pastor Bob Shull, his attorney, and other educational leaders experienced in these matters, John has decided to appeal his termination before the Loudoun County School Board. Because of John’s faithfulness as a brother in Christ, his impact for the sake of the gospel, and the clear injustice of his termination, the leadership of RBC desires to support him in his appeal. Naturally, in a church our size, many of you may not know Dr. Brewer on a personal level. Without a more complete knowledge of him or the facts surrounding his recommended termination, it is understandable that many of you would be reluctant to e-mail a note to school board members, sign a petition or make a call in support of John’s reinstatement. However, I want to assure you that the details surrounding this matter, John’s role in it, and his character have all been seriously considered by both pastoral staff and the Elder Council. Based on our knowledge of the situation and of Dr. Brewer himself, the leadership at RBC believes the recommendation for termination is extreme, unwarranted, and unjust. As can happen in any situation like this, some of what is stated in various newspapers is not accurate. Loudoun County Public School representatives are not accusing John of a violation of policy, insubordination, or of violating any civil or criminal law. Consequently, although you may lack details, we are asking you to trust our collective judgement, pray for John, his family and the School board, and for you who are lead, to please attend the Loudoun County School Board Meeting in Ashburn on Tuesday, January 10, in support of John’s reinstatement as principal at Dominion. This is one of those circumstances when having a lot of people simply show up can have a great impact, so your presence matters. Additional information on the specific location, and time of the meeting as well as recommended actions you can take are listed below. In a case like this of clear injustice, we want to do for one what we wish we could do for everyone. If you have questions, please contact me at brucecampbell@restonbible.org or call me at 703-404-5011. Pray for each LCSB member to vote to reinstate Dr. Brewer as Principal at Dominion High School. Pray for peace and wisdom for Dr. Brewer, his wife Rachel, and his daughters Belle & Abby during this time of uncertainty and waiting. Attend the upcoming Loudoun County School Board Meeting on Tuesday, January 10. Numbers matter. Your presence – even for 1 hour – is important. Even if you can’t get into the auditorium because of the crowds, being in the hallway or on the front lawn even for half an hour will be part of the impact. When: Tuesday, January 10, at 6:30pm. If possible, arrive no later than 6:00pm. Sign up to speak on behalf of Dr. Brewer’s character, the story of Dominion High School and his record of excellence there by calling 571-252-1020 or by emailing clerk@lcps.org. A fund has been established to help Dr. Brewer defray the significant legal costs resulting from the LCPS hearing process. You can help or find additional information at the GoFundMe page. 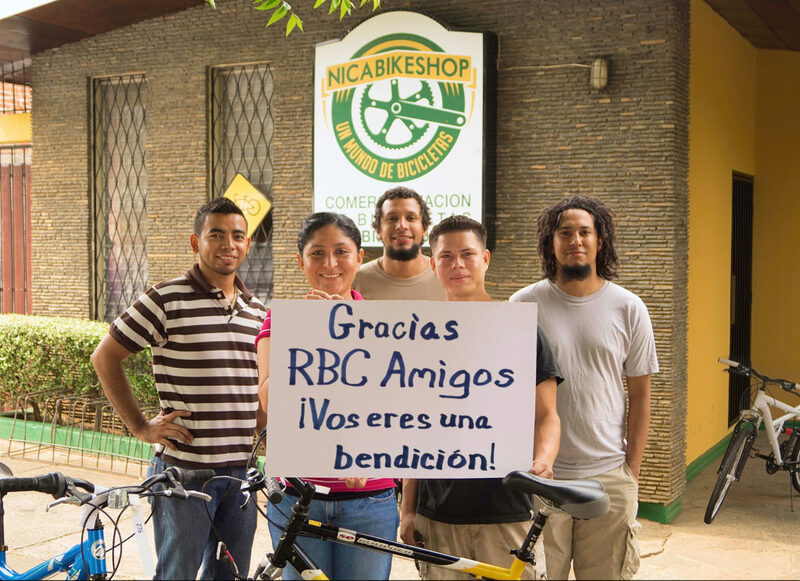 We are thankful that over 500 hundred bikes have been donated by RBCers in support of the Casa Bernabe orphanage in Nicaragua. We also received the message below from Cal Covert, our ministry contact for the bike donations. Cal is on the board of directors for NicaWorks, the non-profit organization that oversees the bike collection and many other aspects of care, support and ministry in Nicaragua. The bike shop has provided opportunities for many Nicaraguans, including orphans and at-risk youth. It is now the largest bike shop in all of Nicaragua. RBC has played a vital role in donating more than 500 bikes to the ministry. The shop has been a tremendous opportunity to mentor young men and women who otherwise would have no hope of a future for themselves or their families. For example, Josh, the director of the bike shop is a recovering alcoholic. Last fall he looked me square in the eyes and said, “If it wasn’t for this business, I know I would be dead right now.” Not only has he pulled his life together, but he is in a strong walk with Jesus that he never had before. Josh meets with his Nicaraguan and American (via Skype) mentors at least once every week. Thank you, RBC, for your continued generosity as we know Christ and make Him known in Northern Virginia and around the world! 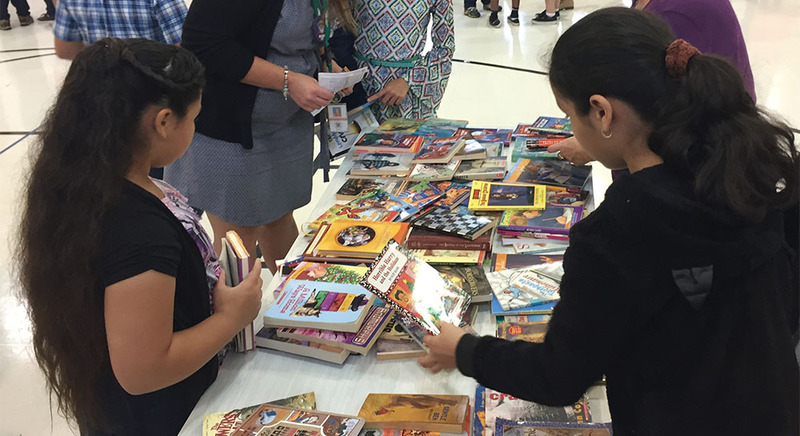 Praise God for all who donated books and gave their time sorting, setting up, and assisting the children at last week’s Guilford Elementary Book Fair. We were able to give out over 2,000 books! Each child took home three of their very own, just-right books, and their faces were beaming as they picked them out. While the book fair was going on, the children were also getting their fall pictures taken. One of the photographers came over to the tables and asked where the books came from. We were able to tell him about Reston Bible and our partnership with Guilford. We told him about the many ways we are able to show the love of Christ by meeting the needs of the community. He shared how much it meant to him as a father who cannot always provide extra things like books when he is struggling to put food on the table. Because of your generosity, we were able to give him and the other photographer a stack of books for their children as well! After the last child picked out his books, the teachers were able to come and gather the remaining books for their classrooms. There are many first-year teachers at Guilford this year, so they were incredibly thankful to stock their classroom shelves. The Guilford staff, children, and parents thank you for your continued support. We will have another book fair in the spring, so hold on to those books! As the leaves begin to change, the air becomes crisp, football is on, and you may hear the words “First Fruits” thrown around at Reston Bible Church. Each year the fall season and First Fruits go hand in hand. First Fruits is a church-wide community service project. That can mean a lot of different things, so let me explain a bit more. 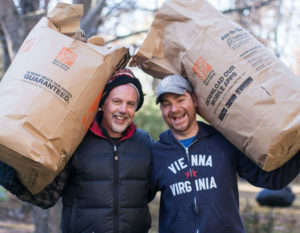 On the Saturday before Thanksgiving, an army of over 700 volunteers in different teams move in full force across the Northern Virginia area from 8:00-5:00 p.m. raking leaves, cutting grass, moving things, cleaning yards, and more. Donations are then collected from the jobs, and at the end of the day the teams go to Shoppers in Sterling to buy food for a family whom they will deliver the food to that night. In physically delivering the food to the family, you have the privilege of making a personal connection with families in our community. This is enjoying the “first fruits” of your labor. We work hard together all day and then get to see what our hard work accomplishes. First Fruits began some 25 years ago with a dream to do something different than the norm. There are a lot of great service projects out there, like collecting blankets for the homeless. Yet a desire was born to help those who are under the radar—like a single mom who has no government assistance and is working many jobs, but still cannot make ends meet. Or a family with both parents working that still has financial struggles. Or a family where one parent is battling cancer or a spouse has died. 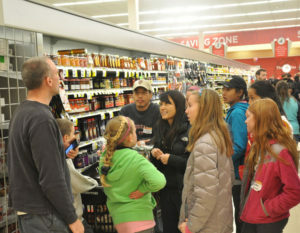 First Fruits works with the local schools who know those who fit what this project is looking for. RBC attendees also submit forms for those they believe could benefit from this day. God has consistently used this one day of serving to provide in a unique way for our local community. Last year over $37,000 was raised in ONE day! This year we are praying and asking the Lord to provide more Team Captains so we can have more teams that are smaller and more manageable. You can be a volunteer to work that day. You can provide a job for a team to do that day. You can refer someone you believe is in needs of food assistance. You can make a donation toward First Fruits. You can go here for more information on how you can be involved, or to register. Having participated in First Fruits for the past three years, I can say the day is truly soul satisfying, not to mention you sleep well that night. First Fruits is being “The Church” outside of the church walls. I believe the emotional and spiritual impact we have far outweighs the physical and financial gift we bring. Yet the physical and financial gift is what paves the way for the emotional and spiritual impact. During the summer, International Connection, the English as a second language program at RBC, does not have classes. Instead I match upper-level students who can carry a conversation, with volunteers from the church. Students benefit from having someone that they can regularly speak English with all summer long. We suggest meeting once a week or once every other week at a public place such as cafes, fast-food restaurants, playgrounds, the mall or parks. Recently, I met with a good-sized sampling of the 26 pairs that I put together in June and we chatted about their experiences over the summer – both the students as well as the volunteers. Early on, I had heard some negative responses from those who had trouble maintaining communication with their students (this was the tiny minority) so I was not prepared for the inspiring comments that I heard from the partners who attended last week’s meeting. One volunteer had waded into the bureaucracy of a government-run, low-income, home-buying program in which his Chinese student and his wife had found themselves. Imagine dealing with all of that government and real estate jargon in another language! The volunteer patiently helped them figure out what documents were needed and then also why they had not heard back from the agency in question. They finally ended up with an application that is now being processed and this couple will soon start the search for their new home! This volunteer also assisted the student’s wife as she tried to find books in the library that were at her reading level. All of these activities are intimidating to people not born in this culture. Another volunteer helped her student navigate the complexities of scholarship programs available to her high school child – a task that she was eminently suited for as a Fairfax County school teacher! Several volunteers mentioned the hard-working nature of their students and cited their international friends as admirable examples to their own children of perseverance not only in language acquisition but also cultural integration. These students were/are serious about living and working here! Very often we take our comfortable lives here for granted and we do not realize the uphill climb it is for 99 percent of the immigrant population that choose to settle here. When we do not develop a personal relationship with an international person, we miss out on knowing the great highs and lows of the immigrant experience. My faithful volunteers got to see this and are richer and more empathetic people because of it. Thanks be to God!